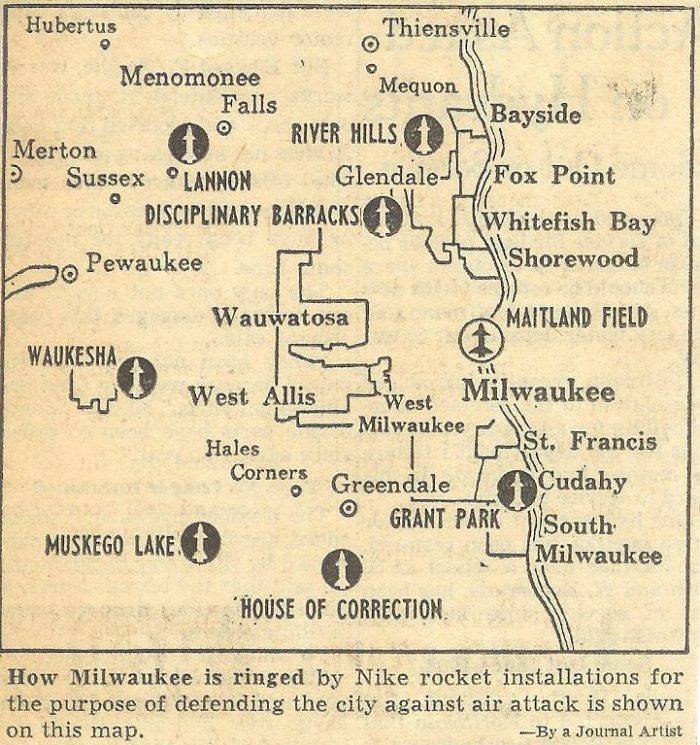 Milwaukee was one of a handful of Midwestern cities equipped with launching stations for Nike anti-aircraft missiles during the 1950s and 1960s. Milwaukee’s defense ring consisted of eight sites, including the lakefront Maitland airstrip. Each site housed up to twelve radar-controlled rockets capable of shooting down planes traveling at supersonic speeds. Beginning in 1958, the Maitland, Waukesha, and River Hills stations acquired the more lethal Nike Hercules weapons while the remaining Milwaukee-area sites retained the smaller Nike Ajax. 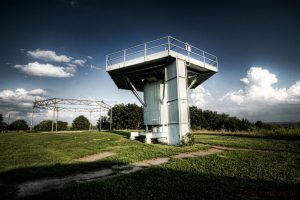 In 1971, the army announced it would close all of its Wisconsin missile facilities. The abandoned Maitland station is now home for the city’s annual Summerfest. ^ Other cities were Chicago and Detroit. See “Plan Undisclosed Number of Sites in the Milwaukee, Nearby Area,” Milwaukee Journal Sentinel, October 9, 1954, http://news.google.com/newspapers?id=67kyAAAAIBAJ&sjid=3A8EAAAAIBAJ&dq=undisclosed&pg=4980%2C6206631, accessed January 15, 2013. ^ “Council will get Proposal to Lease Maitland Nike Site,” Milwaukee Journal Sentinel, January 5, 1956, http://news.google.com/newspapers?id=8HJQAAAAIBAJ&sjid=cxAEAAAAIBAJ&dq=nike%20site&pg=3777%2C2525120, accessed January 15, 2013. ^ Cities to get New Missiles: Policy is Changed,” Milwaukee Journal Sentinel, June 29, 1960, http://news.google.com/newspapers?id=G1saAAAAIBAJ&sjid=5yUEAAAAIBAJ&dq=new%20missiles&pg=7372%2C3974318, accessed January 15, 2013; “Army Announces Closing of all State Nike Sites,” Milwaukee Journal Sentinel, March 4, 1971, http://news.google.com/newspapers?id=w98jAAAAIBAJ&sjid=fCgEAAAAIBAJ&dq=army%20announces&pg=7214%2C1444522, accessed January 15, 2013.